SUSPENDERS (American English) or BRACES (British English) are fabric or leather straps worn over the shoulders to hold up trousers. Straps may be elasticated, either entirely or only at attachment ends and most straps are of woven cloth forming an X or Y shape at the back. Braces are typically attached to trousers with buttons using leather tabs at the ends or, incorrectly according to traditional protocol, clips. There have been several precursors to suspenders throughout the past 300 years, but the modern type were first invented in 1822 by Albert Thurston and were once almost universally worn due to the high cut of mid-nineteenth and early twentieth century trousers, a cut that made a belt impractical. After losing popularity in the first World War, as men became accustomed to uniform belts, suspenders were still standard throughout the 1920s. Because of their image as underwear, men switched to belts during the 1930s as the waistcoats which had hidden braces became worn less. This also signaled the switch of position of the buttons from the outside of the waistband to the inside. Though the return of fuller-cut trousers in the 1940s revived braces, they did not dominate over belts again to the same extent. High quality suspenders usually considered white collar (US), or upper or upper-middle class (UK) wear and are made to be attached to trousers by buttons only. Noted manufacturers include Albert Thurston (sold re-branded by most outfitters), who supply high-profile actors, such as Daniel Craig in the role of James Bond in Casino Royale and Michael Douglas as Gordon Gekko in Wall Street and John Barrowman as Captain Jack Harkness in Torchwood. In traditional or formal settings, it is considered a faux pas to wear both suspenders and a belt at the same time, though this has not always been the case among all classes in the past. Further, it was considered that as underwear, suspenders should never be seen at all. As was usual before the War, the waistcoat, or for coolness in summer a jumper or cardigan, covered up parts of clothing then considered improper to be seen, such as suspenders, and similarly jumpers and jackets kept the shirtsleeves hidden. Even before the War, however, men began removing jackets in public, and so this sensibility was eroded. It is perhaps only in Britain that some still consider it "gauche" to wear (for example) brightly coloured suspenders, or suspenders with no jacket. In general however, it is now considered acceptable on both sides of the Atlantic for suspenders to be visible, and in 2008 it was even fashionable for colourful or designer suspenders to be prominently on show. The trousers for suspenders have buttons for attaching the tabs, either on the outside (traditionally) or on the inside of the waistband, which does not have belt loops. The trousers also have a high back in the fishtail shape, though this is not so common now; this shape has an additional adjuster strap at the back as well as the two side adjusters placed on most belt-less trousers. 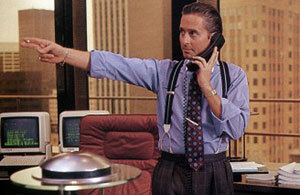 A Brief History of Suspenders - TIME Magazine. A Guide to Wearing Suspenders - Articles of Style. Albert Thurston Suspenders Review - Gentleman's Gazette. EVERYTHING YOU NEED TO KNOW ABOUT SUSPENDERS - The GentleManual. how to wear Suspenders - Man's Guide to Braces. in defense of Suspenders - Parisian Gentleman. AgnÈs B. - Fabriqué en France: stretch straps bouton. Barathea Braces - at Shibumi. BRIONI - since 1945. Silk Smoking / Tuxedo Suspenders. CHARVET - founded in 1838. French high-end men's shirt maker & tailor located at 28, place Vendôme in Paris, France. DRAKES LONDON - since 1977. E. MARINELLA - since 1914. GIEVES & HAWKES - "British Tailor founded in 1771 - Flagship Store at No.1 Savile Row London." GRESHAM BLAKE - since 2000. HACKETT - since 1979. "Hackett is the home of Essential British Kit." HARVIE & HUDSON - "The Family Owned Jermyn Street Shirtmakers Since 1949." HENRY POOLE & CO - "Founders of Savile Row. Pure bespoke since 1806." HUNTSMAN - established 1849. 11 Savile Row, London, U.K. "We carry braces in a variety of jolly (and more sober) colours, made for us in the UK by the eponymous manufacturer, Albert Thurston. 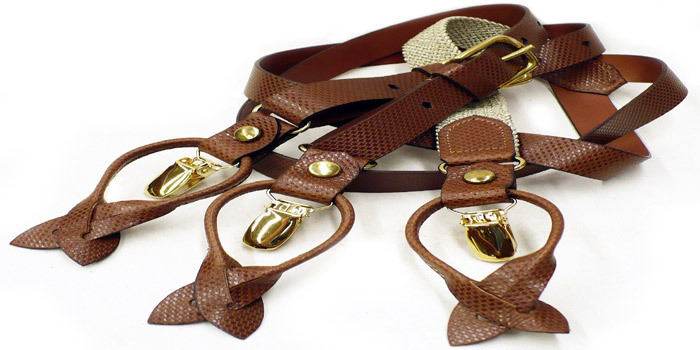 All of our braces are 38mm wide and are produced in pure wool boxcloth woven in the Yorkshire Dales." J.PRESS - "Since 1902, J. Press is a storied American clothing label, having dressed men of the Ivy League for the past century." Mrs Bow Tie - "Handmade in England." Matching bow ties are available. NEW & LINGWOOD - since 1865. 53 Jermyn Street, London. Paul Stuart - since 1938. Upscale retailer known for its unique take on Anglo-American classics. Ralph Lauren - since 1967. Roderick Charles - 90 Jermyn Street, London. Shibumi - Barathea, Boxcloth, Dugdale Linen & Hardy Minnis Bamboo Braces. THOMAS PINK - since 1984. Now part of the LVMH gorup. Jermyn Street, London, U.K.
T.M.LEWIN - established 1898. Jermyn Street, London. TOM BROWN TAILORS - since 1784. Eton & London. Traditional braces. TRAFALGAR - "Made in the USA." TURNBULL & ASSER - since 1885. "Made in England." 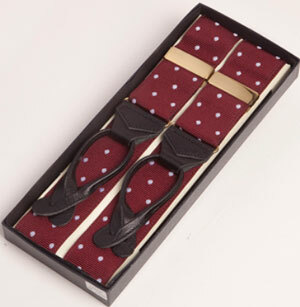 "Our handmade felt braces are made from Yorkshire-woven wool boxcloth, which is shrunk to half its size. The leather ends are stitched by hand." 71-72 Jermyn Street, London. Viola Milano - since 2012. WESSEX - plain coloured braces. Zana Bayne - "Post-Fetish Leather Brand."